Sorry... the 2017 Volvo XC60 is no longer being sold as new. Instead, take the first step to a great deal on 2019 Volvo XC60 with a free price quote! 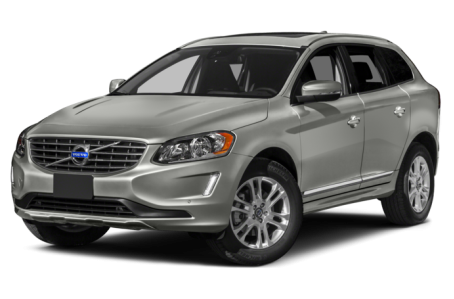 The 2017 Volvo XC60 is a compact luxury SUV that seats 5 passengers. It competes with the Audi Q5 and BMW X3. This year, the XC60 has simplified its trim level and powertrain options. Three trims are available: the Dynamic, Inscription, and R-Design. Overall, the XC60 has moderate-looking exterior. The front-end proudly displays Volvo’s crest-shaped grille, which is flanked by angular headlights. The rear taillights are mounted high and fully cover up the D-pillars. Rugged-looking, skid plate accents at the front and rear fascias provide color-contrast and visual interest. Standard features include LED daytime running lights, power/heated side mirrors, a panoramic moonroof, a dual-pipe exhaust system, roof rails, and 18-inch alloy wheels. The R-Design trim comes with sportier, sleek styling, adaptive headlights, skid plates, a power liftgate, and larger 20-inch alloy wheels. Under the hood, the XC60 is powered by a standard 240-hp, turbocharged 2.0-liter four-cylinder engine mated to an eight-speed automatic transmission. Front-wheel drive (FWD) comes standard, while all-wheel drive (AWD) is available. A powerful 302-hp, supercharged and turbocharged 2.0-liter four-cylinder engine paired to the eight-speed automatic and AWD that produces 295 pounds-feet of torque is also available. Inside, the XC60 has a leather-upholstered interior with a 60/40-split folding rear seat. The Dynamic trim comes with sporty front seats and aluminum inlay, while more comfortable seating and wood-inlay is the focus of the Inscription trim. The R-Design trim has its own unique interior treatment. The center stack features a Sensus Connect multimedia system with navigation, apps, voice recognition, Bluetooth connectivity for phone and audio, DVD playback, and a USB port. Standard features include automatic air conditioning, power front seats, remote keyless entry, power/windows locks, and cruise control. A configurable digital instrument panel, heated front and rear seats, a memory seat, a heated steering wheel, and a Harman Kardon premium audio system are also available. The XC60 was named a Top Safety Pick Plus by the Insurance Institute for Highway Safety (IIHS). It also earned a full 5-star overall crash test safety rating by the National Highway Traffic Safety Administration (NHTSA). All XC60 trims have the standard City Safety system, which includes adaptive cruise control, a collision prevention system with automatic emergency braking, pedestrian and cyclist detection, and a post-accident mitigation system. Other standard safety features include a backup camera, rear park assist, and a blindspot warning system.